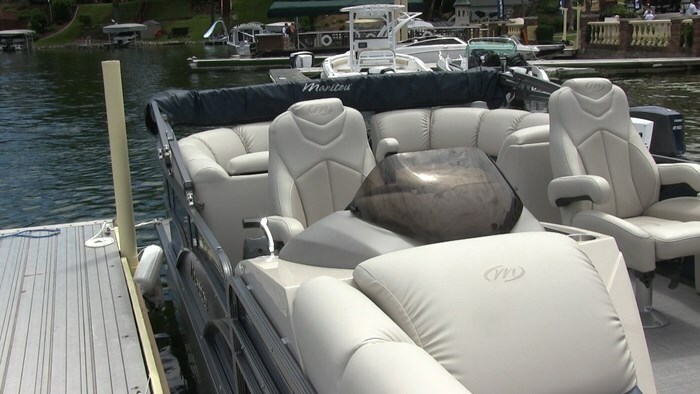 Every year more boaters are turning their attention towards pontoon boats for their ability to “do it all” although it’s very rare to find a pontoon that actually can. What I mean by this is it’s usually one or the other. It’s either really nice or affordable with compromises. Affordable usually means a compromise in performance as well. It’s hard to find a pontoon that’s elegantly appointed, has great performance and is affordable, that was until I got my hands on the 2016 Manitou Encore 23 SHP. 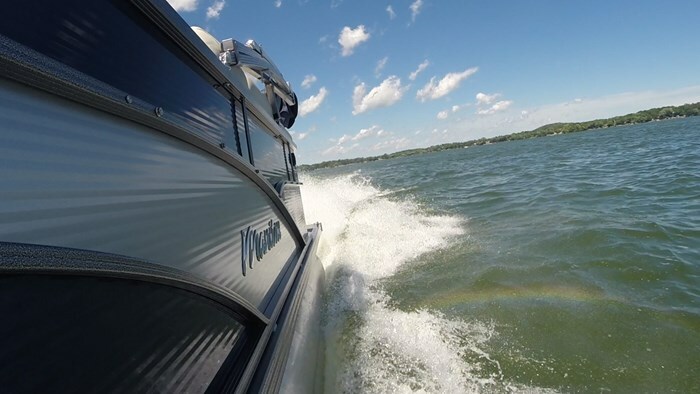 Built just outside of Lansing, Michigan, Manitou Pontoons are trendsetters in the pontoon world, known for pushing the envelope and trying new things to keep the pontoon industry moving forward. Manitou has the patent on the V-toon technology, in a nutshell, they mount the center pontoon lower in the water to create a V-bottom running surface like a traditional runabout. Their Encore lineup of boats acts as a transition between their really nice, high end luxury models and their more affordable, value priced boats. It’s like the Goldilocks and the Three Bears of their models. Some are too hot, some are too cold, the Encore is juuust right! With models ranging from 23 to 27-feet the Encore 23 RF that I tested I feel is a perfect size as it gives you plenty of interior space and it still easy to manage on a trailer or around the docks. The RF indicates that this particular Encore has matching loungers in both the bow and stern groupings. You see this a lot in the industry now and I think it is taking over from that traditional L grouping mid ship. 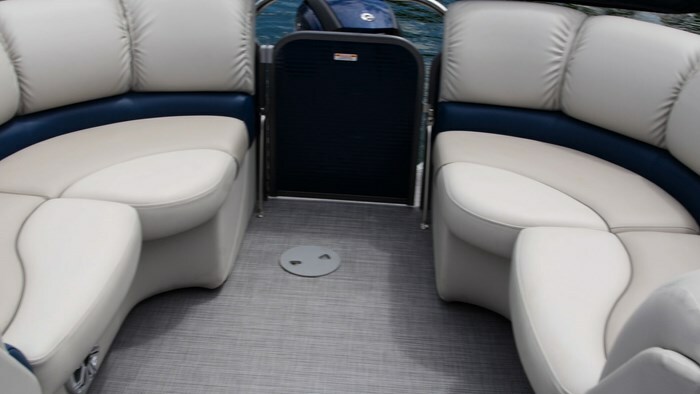 This open floor plan creates the most amount of space, seating and keeps a nice flow in the boat while keeping the pathways unobstructed. 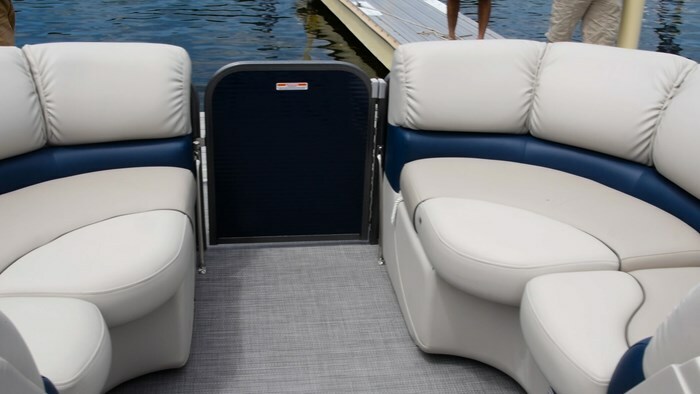 The loungers feature Manitou’s pillow top seating that is as plush as your La-Z-Boy at home. 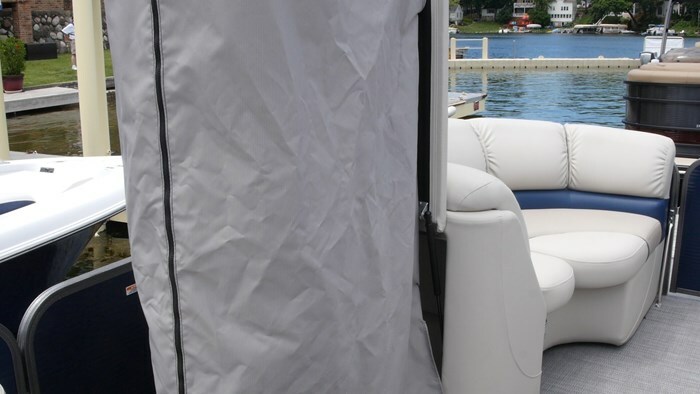 IT features their Comfort Touch marine grade vinyl, which feels soft but you can be assured that it can withstand the rigors of day to day boating. To help keep it looking fresh they include a colour matched mooring cover standard with this model also. Since the seats are so comfortable it will be a pain when someone asks you to get up and put something into the storage found beneath the seats, but what won’t be a pain is opening them. They feature Manitou’s signature lift hinges as the seat lifts up from the front and flips open forward, keeping the cushion attached but still giving you full access to the storage. I like this because loose cushions can blow loose at times, and some hinges restrict access. The helm on the Encore is perfectly suited for the message it is trying to send. It’s a moulded fiberglass stand, but it’s not raised. So you’re still getting the styling, but you’re saving some money there. It features twin gauges that flank a center area that can be used to mount a GPS system, a non-skid tray you can toss a cell phone into and plenty of drink holders. Exterior styling on the Encore 23 RF SHP is subtle and elegant. It features Manitou’s corrugated fence panels which not only looks sharp but increases the structural integrity of the gates also. The boat I tested had a navy colour with silver accenting stripe. The SHP in the name refers to the running surface. The Sport Handling Package, or SHP, features triple pontoons with positive angle lifting strakes. Not only do they perform great, but they are built to stand up to the test, featuring their Barracuda Nose Cone. The nose cone is reinforced because that is what takes the most pressure and is the first contact with the water. But a running surface is only as good as the motor that’s attached to it, and for this test we had something really special. This Encore SHP had the brand new, newly launched Evinrude E-TEC G2 150-hp outboard. An expansion of the award winning G2 series that was launched in 2014, this new 150-hp outboard is ready to set the standards in what a mid-range outboard should achieve. Starting with a brand new 66-degree, V6 block, the folks at Evinrude used the formula from the higher horsepower G2 line and scaled it back to the accessible 150 to 200-hp range. I love this move because as nice as the G2’s are, it’s tough to sell a lot of those big horsepower motors. But if you take a walk through a boat show, look at how many boats, and how many different types of boats are displayed with a 150. Like the original G2, the new 150 is designed to have more torque, be more fuel efficient and have less emissions all while providing the comfort and technology you should expect from a modern engine. Let’s address the elephant in the room. It’s a two-stroke. So? Think about that, what does that even mean? “They’re smokey.” No, OLD two-strokes were smokey. 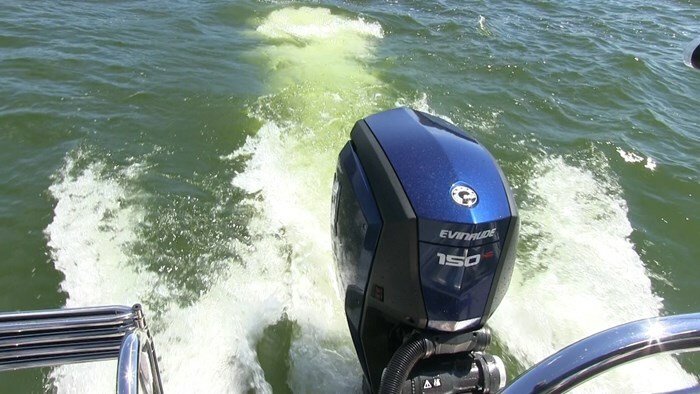 All that it meant was the process needed to be refined a little and Evinrude dedicated themselves to it and what they were rewarded with, is one of the best engines out there. As we idled out I was reminded of the ever present two-stroke growl of the 150, which was just at the right level. It wasn’t louder than any of its four-stroke competitors. When I put the throttle down, the motor sprung to life rocketing the Manitou to plane in under 4 seconds. I actually had to look back to double check that it was, indeed, a 150-hp on the back of this thing. Aside from power and torque, Evinrude has dedicated a lot of effort into improving the overall boating experience. Think about it this way, you wouldn’t buy a car with crank windows and manual locks anymore, right? 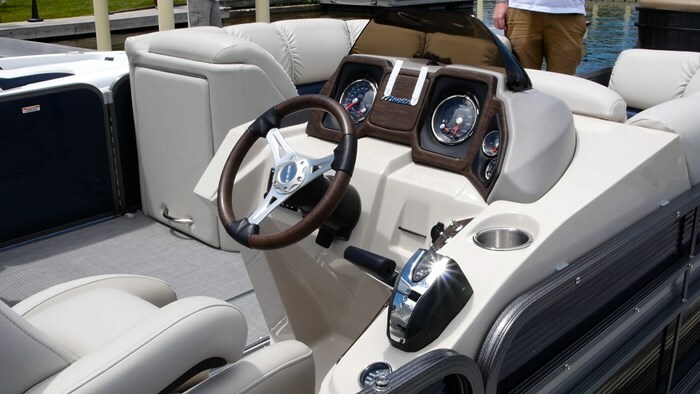 Well Evinrude believes that a high tech engine, should have comforts that match it. So each G2 comes with power assisted steering, digital throttle and shift controls for smoother shifting between gears and iTrim, an automatic trim feature. “Oh but I can drive a boat, I know how to use the trim.” Stop it. It’s like having a manual or automatic car. Sure you can drive a stick, but it’s nice to be able to just sit back and cruise and not have to worry. That’s what iTrim does. I went to set up for a tight turn, as one of the hallmarks of the SHP is its superior handling, and I heard the motor start to cavitate. Well before I could get my hand down to the trim switch iTrim had already compensated for this and trimmed the engine down, keeping my power supply constant. So I turned the other way and let iTrim do the work. So what this now does is allows me to keep both hands on the wheel, which would be ideal for taking the kids tubing. 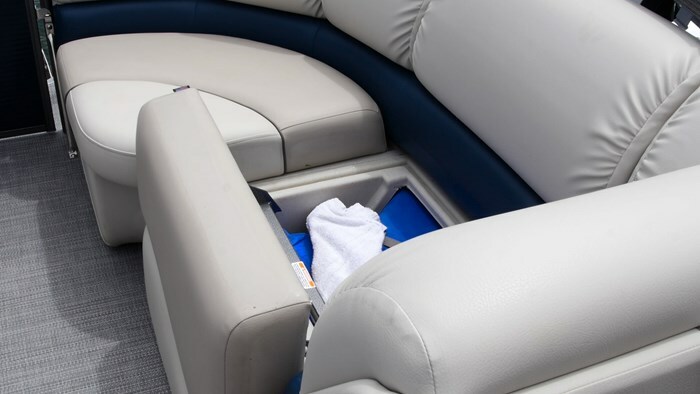 These comforts allow you to focus on the boating experience, rather than on boating itself. Should you wish to override this you easily can, but I see no need to do so. Without the engine the Encore 23 RF SHP weighs 3100 pounds. Add an engine, and 4 guys and you have what we had in these test conditions. Any ordinary 150-hp on a 23-foot pontoon would have its work cut out for it. But the 150 G2 is no ordinary engine. With that load we hit a top speed of 34 mph at WOT. What was even more impressive was the mid-range. Even at 4000 rpm which is high up there in RPM, when you put the throttle down to 5000 rpm the engine still boosts forward like hitting a turbo button and you get another almost 10-mph. But like I said you can’t have one without the other. A great motor is only as good as the running surface it’s on and the SHP on this Manitou was a great pairing for it. It’s nice to be able to have it all, to have a 23-foot pontoon, that looks great, that’s nicely appointed, doesn’t break the bank and goes like stink - well that’s the Encore 23 RF SHP.